I checked out a flick on Tuesday night that turned out to be much better than expected. 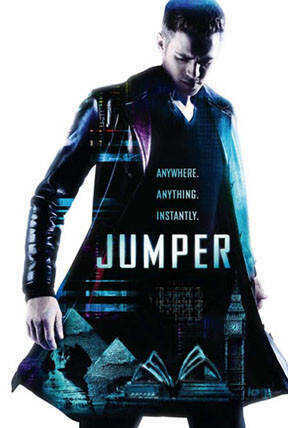 The movie in question is Jumper starring Hayden Christensen and Samuel L. Jackson. This is one of the best "What if" movies I've seen in a long time. What if you could teleport? What if you could go anywhere at anytime? Sound nice? I thought so. The movie opens with a voice over recounting lead character David Rice's day, which has encompassed the world -- all before lunch. Rice is a character whose story begs to be told. For fans of Steven Gould's novel, don't expect to find much of it here. The skeleton of the original idea is there but little else. This causes the screenplay to really have no direction, but just the premise behind the movie is intriguing enough to keep you watching. The audio commentary by director Doug Liman, writer/producer Simon Kinberg and producer Lucas Foster addresses the story issue but offers not much in a way of explanation for the change. One common dislike of the movie I've read and heard is the main character isn't likable. If the flick would have kept the original scene of how and why Rice first teleports, it would have been more powerful than what the movie offers. The effects are abundant and only betray themselves in a chase scene involving Rice and Griffin midway through. The scene almost makes your brain feel as though it's going to melt. The "jumps" are one of the coolest and subtle effects I've seen in a while. Now here goes my tirade, defending Hayden Christensen. I've heard all the arguments about the "cardboard" performances he's given and how he almost single-handedly killed the Star Wars prequels. The truth is Christensen is a talented actor, who if not chosen to be Anakin Skywalker, would be talked about all over Hollywood. Anyone who questions his ability should watch Shattered Glass or Life as a House. Both performances are unique and show that he will be a force long into the future. His "cardboard" performances would be revered if delivered by a McQueen or Newman. Yeah I said it. I challenge anyone to prove me wrong. For movie geeks such as myself, the DVD provides an abundance of extra goodies for your viewing pleasure. In addition to the audio commentary, the disks have the bonus features "Jumping From Novel to Film," "Making an Actor Jump featurette," and "Previz: Future Concepts." For the two-disk Special Edition, you also get the bonus features "Doug Liman's Jumper: Uncensored featurette," "Jumping Around the World featurette," "Jumpstart: David's Story -- Animated graphic novel," and deleted scenes. Final Cut: Sit back and let your mind ponder the possibilities. Jumper opens a Pandora's Box of ideas but never really takes hold of them and runs. The effects are great and the assurance of a sequel promises more thrills to come. But the question remains -- would you choose as David does or walk the straight and narrow? Yeah, that's what I thought.